Oh, the power of well-timed, emphatic praise. Reinforcing good performance immediately and with great joy practically guarantees repeated attempts of the same performance. Mastering the art of praising enables teachers to inspire students easily and with very small time investment. It does, however, require that you pay a lot of attention to your student’s’ performance (in order to catch them right as they perform well), and a willingness to share your pleasure at your student’s awesomeness. 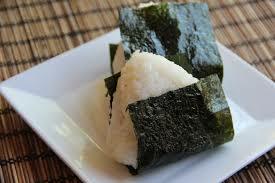 A few days ago, my friend taught me how to make rice balls (onigiri). I love this traditional Japanese snack / travel food, and I have been wanting to learn how to make it on my own for a long time. The big day finally came, and we had a rice-ball-making party. The process isn’t complicated, but requires some attention. In a nutshell, the preparation involves scooping warm rice onto the palm, hiding whatever delicacies one wishes inside the rice (say, kimchi or pickled plum), shaping the rice (somewhat non-obviously, the traditional shape of a rice ball is a pyramid), and finally wrapping the rice ball with a sheet of seaweed. She then proceeded to celebrate the fact that the particular way I had wrapped the rice ball, with one tip of the pyramid poking through because of how I (accidentally) folded the seaweed, looked “just like how they sell rice balls in stores in Japan.” Naturally, I was very pleased. But when I started on wrapping my next rice ball, I realized I was paying a lot of attention to replicating my previous technique. And when I finished wrapping my rice ball, I was proud of the result – even though, minutes before, I was not even aware that there was anything to be proud of regarding the way I wrapped rice balls. A single, well-timed, emphatic celebration of my successful performance instantly ensured that I would do my best to replicate my work on future occasions. The effect on the learner (me) was visceral, emotional; very different from doing a post-rice-ball-party debrief, reviewing what went well and what should be done differently. Next time you teach, challenge yourself to catch students when they are performing well and immediately sharing your pleasure with them. Good performance can take place on any number of levels: A student may offer an especially insightful question (or answer) regarding a text you are teaching, or focus studiously while doing independent work, or arrive at the classroom 2 minutes prior to the start of the lesson, or help clean the classroom, or say “good morning” to you, or…. well, you get the idea. Note how you feel as you hunt for good behavior, how you feel as you praise, how your student responds. Come back and share your observations in the comments section for this post. We would love to hear how your experiment turned out.